The Top Billing presenter has had an incredible past couple of years professionally, which has seen him make lots of money, travel the world and live the life of his dreams. In addition to his TV work, Maps has always prided himself in doing some charitable and humanitarian work whenever he can. His annual Pearson Institute bursary scheme awards deserving learners with R75 000 towards making their academic journey that much easier. He has now expanded his local efforts of goodwill and helped out a Western Cape community in need of clean drinking water. 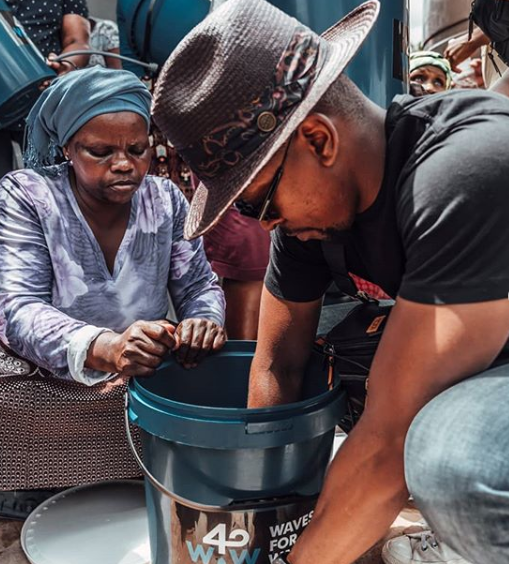 Maps joined forces with local NGO, Waves For Water to bring safe and clean drinking water to the community of Langrug in Franschhoek, Western Cape. “What A Privilege It Is to Help: There are over 5 million South Africans without access to clean drinking water and 14.1 million without access to safe sanitation - Things that should be a basic right to all,” said Maps. Waves for Water was founded in 2009 with the aspiration to get clean water to every person who needs it. The organization challenges tourists to explore while giving back to the communities they visit. Maps, a well-traveled young personality, was the perfect public figure to partner with in their plight to raise awareness for the need to clean and safe water. “The filtration systems ensure clean drinking and potable water in spite of retrieving it from dirty or contaminated water sources in the community that cause and encourage the spread of sickness and disease. Something so simple that we take for granted every day. Each home filtration system can filter up to 4 million litres of water, that's around 100 people per filter for at least 5 years, and can make a big difference to people's lives,” said Maps. The 28-year-old encourage everyone to think about what it is that they can do to help and also reminded us that it is indeed a privileged to help.